This morning as the rain was clearing out, I went to a clients property in Collegeville to quote some pruning work. While there I noticed an eastern red cedar tree that was just beginning to “bloom” with the reproducing stages of cedar apple rust. 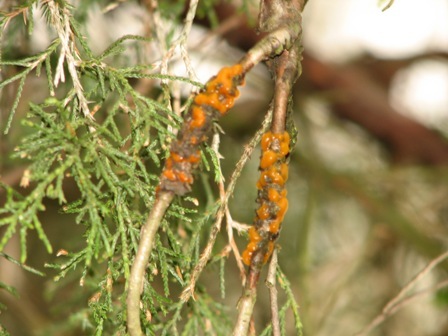 This common disease has a very interesting lifecycle : the fungus that grows as a leaf spot disease on apple trees produces spores which, when carried by the wind are deposited on cedars or other species of juniper, grow to form galls on the juniper twigs. 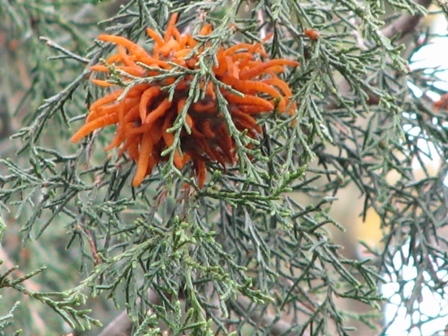 Then, after a spring rain when the temperature is suitable, the galls erupt into a brilliant orange jelly-like substance that is the spore producing stage on cedars. This reproducing stage occurs magically fast after the rain, then only lasts a few days. Spores from this fruiting body then infect the leaves of apple trees to complete the 2-stage lifecycle.